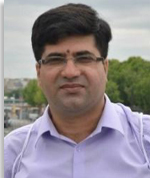 Dr. Shafiq Ur Rehman is an active and well-known personality of library and information science (LIS) in home and abroad. He has recently completing his doctoral degree (HEC sponsored) from France (2009-2012). He is first HEC scholar from LIS domain who completed PhD from abroad with the highest distinction (very honorable with the unanimous felicitation of the six member jury). Dr. Shafiq engaged in teaching at all levels (Master, MPhil and PhD) using relevant teaching methods, e.g. lectures, seminars, tutorials. He is carrying out independent research and published more than 20 research publications in national and international journals of repute (HEC recognized) and presented 10 research papers in international conferences. He is also supervising postgraduate research student projects and dissertations. As well as working as a Managing Editor of Pakistan Journal of Library and Information Science. He has more than 16 years of professional and teaching experience in universities and academic institutions of Pakistan. He also received three cash prizes from the vice chancellor of university of the Punjab for excellent performance in library services. He is coordinator of continuing professional development cell of the department and organized different training programs for capacity building of information professionals, teachers and research scholars in the area of information literacy and research in home and abroad. He is listed trainer and Consultant QSR International, Australia and other research softwares like NVIVO (Australia), Endnote (USA) and Idea Puzzle. Since 2012, He has provided training (Onsite and online via Webinar) to more than 700 university faculty members and researchers. He is the recipient of Info-share award of ASIST (American Society of Information Science and Technology) for the year 2012. He has also provided consultancy services to various libraries of Pakistan. He knows four languages (English, French, Urdu and Punjabi). Library Service quality, knowledge sharing, advance searching skills, citing and referencing, How to publish, information literacy, plagrism, writing research proposal, academic writing, managing qualitative research through NVivo software, quantitative analysis through SPSS, literature review -using Endnote and NVivo Software, managing academic thesis for MS and PhD, research ethics, effective handling of Turnitin- software, mixed method research, qualitative research and quantitative research.